Denver's local mountain for over 75 years! Portable rope tow operations installed by J.C. Blickensderfer. Operations at Loveland Ski Tow Company begin. Operations are taken over by Al Bennett with a rope tow that was powered by a Model T engine. Two rope tows “A Tow” and “Rainbow Tow” were added. Named Loveland Ski Tow Inc.
“D Tow” and cleat track tractor added. The cleat track tractor hauled people to “D Tow” and was the only alternative to hiking up. “A Tow” replaced with new rope tow. “B Tow” (rope tow) added. “C Tow” (rope tow) added. This tow filled the gap between the top of “B Tow” and bottom of “D Tow”. September 30, 1951 – Loveland’s earliest opening for the season. 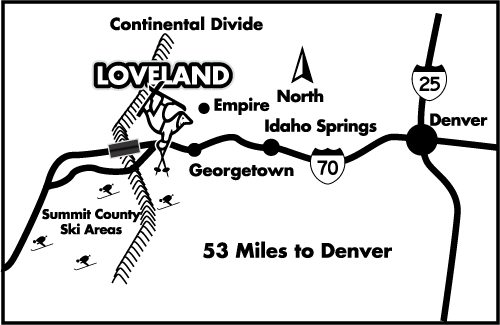 Stockholders purchase Loveland Ski Tow Inc. Partners: C.R. Upham, Jr, Al Bennett, Robert Murri, Bill Bolin, Pricilla Barnard. Peter Seibert named new General Manager. Lift 1 (double chair) was added. Lift 2 (double chair) was added. Ray Parker named new General Manager. “Mambo Cafe” opened near the bottom of current Chair 4. “Fury Creek” was lost as the construction of Dwight D. Eisenhower Memorial Tunnel began. Gorden Wren named new General Manager. Loveland Valley, a separate area for beginners and Ski School, was constructed just east of Loveland Basin to add beginner terrain lost from the construction of the Eisenhower Tunnel and Interstate 70. Otto Werlin named new General Manager. Loveland became the first major ski area in Colorado to have snowmaking capabilities using diesel compressors from the construction of the Eisenhower Tunnel. First season with snowmaking at Loveland Valley. Lift 2 was replaced with a high capacity triple lift. Loveland Valley base area got a facelift with a new building. Lift 8 (fixed grip quad) opened accessing “Zip Basin”. It was named after Zipfelberger Ski Club who regularly hiked to the area for skiing in the 30’s. Ken Abrahamson named new General Manager. Loveland Basin’s main day lodge is remodeled and expanded. Yearly record snowfall hit the area with 586 inches throughout the season. Lift 3 is replaced with a fixed grip quad lift. Lift 9 is installed providing long awaited lift access to The Ridge. Reaching an altitude of 12,700 feet, Lift 9 was the highest chair lift in the world at the time. Loveland Ski Area broke its 24-hour snowfall record 3 times during the March Blizzard. The final record for 24-hour snowfall was finally set from Tuesday at 1pm to Wednesday 1pm when Loveland received 36 inches of fresh powder. Bob Magrino named Director of Mountain Operations. Robert Goodell named Director of Business Operations. Second most snowfall in one season. Loveland received 568 inches of total snowfall. Lift 4 was replaced with a high-speed triple. E Tow Cabin was renovated. Loveland Ski Area celebrates its 75th Anniversary. Unload station added to mid-way Lift 2. The Ptarmigan Roost & Rock House cabins are renovated and expanded. The Ptarmigan Roost Cabin now offers food service and restrooms. Loveland acquires 20 passenger Ridge Cat and offers free snowcat tours along The Ridge. Basin Lodge expansion adds 200 additional seats. The Ginny Lee Cabin opened off Lift 8 and provides skiers and riders with a warming hut and restrooms on the north side of the mountain. New magic carpet surface lift is installed at Loveland Valley. Lift 2 reconfiguration is completed. Existing lift is shortened to the mid-way point and a new fixed grip triple lift is installed to service the upper terrain. The new lift, Ptarmigan Lift, provides more efficient access to terrain previously served by Lift 2. Poma surface lift is removed.